Macau is steeped in contrasts. It is China’s economic giant, earning an estimated 45 billion in gambling revenue, yet it is a tiny peninsula of only 11.39 square miles. It’s a modern city with skyscrapers, the world’s biggest casino at the Venetian Macao and one of the world’s fastest growing economies. But it still preserves its original heritage as a small fishing village, with locals observing centuries old traditions. To me, nothing illustrates the great contrasts of Macau better than the Historic Centre of Macao. 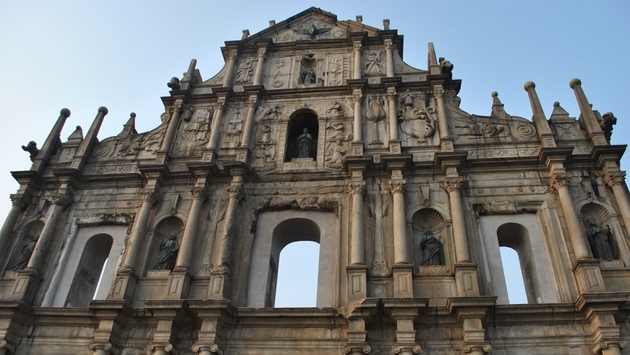 A collection of 22 buildings and public spaces that date back to the 15th century when Macau was a Portuguese colony and bustling trading hub, the Historic Centre of Macau displays the contrast and synergy between East and West. Declared a UNESCO World Heritage Centre in 2005, this area represents the heart of Macau. It takes weeks to fully delve into all of these architectural and cultural marvels but here are a few highlights that I believe best reflect historic Macau. 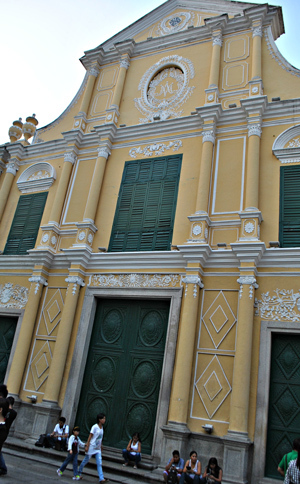 The ornate façade of St. Paul’s church is one of the most recognizable symbols of Macau. Its image decorates post cards, magnets, t-shirts and posters. When I finally stepped in front of the ruins, I felt like I was seeing a celebrated world landmark, even though I had only just heard about it a few months before I visited Macau. I had seen photos so many times that it all looked familiar yet intriguing. Constructed in 1580 by Jesuits, the five tiers of white stones and imposing columns represented the biggest Catholic Church in Asia at the time. The European baroque design includes bas- reliefs and statues of the Madonna and Jesus on the third and fourth tiers. The distinctively Asian elements include lions flanking the third and fourth tiers and chrysanthemum and cherry blossom illustrations topped with Chinese inscriptions. Located in the middle of the Macau Peninsula, Senado Square has represented the urban center of Macau for centuries. The square is filled with candy-colored colonial buildings, traditional Chinese eateries and wave patterned Portuguese tiles that were paved in 1990. It’s a pretty spot that perfectly blends the old with the new. St. Dominic’s Church (pictured), a butter cream-hued building dating from the 16th century, sits in the heart of the square. The church was founded by Mexican priests from Acapulco and was the site of the first Portuguese newspaper published in China. The church is flanked by the Leal Senado building, the government structure covered in columns and iron railings, built in the 16th century that is still headquarters for the local government. Senado Square hosts many Macau cultural events but my personal cultural event involved sitting by the fountain in the center and people watching. Macau may be noted for its casinos but it also displays a sizeable number of temples that dot side streets and pathways. 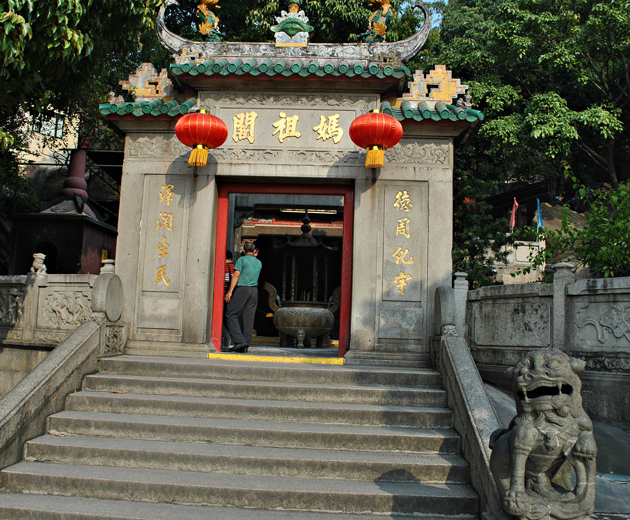 The oldest and most famous is A-Ma Temple, constructed during the Ming Dynasty in 1488. Dedicated to the sea goddess Mazu, who blesses local fishermen, the temple consists of a series of pavilions that connect to the original but were built at different times. Situated halfway up the slope of Barra Hill, A-Ma Temple incorporates the natural landscape as well as traditional Chinese symbolism. Considering the importance of spirituality to Chinese culture, I was most excited about visiting the temple, among all of the historic Macau landmarks. Climbing up the hill, crowds of worshippers and tourists gathered around the entrance. As they moved away, I saw the gateway to the pavilion, adorned with two lions, red lanterns and golden inscriptions. Moving through the six different pavilions, I observed worshippers offering incense and gifts and praying silently. There’s a peaceful aura to the temple and I felt soothed as I stood on the second pavilion and inhaled the spicy fragrance of clusters of hanging, cone-shaped incense. A-Ma Temple is considered an outstanding example of the blend of Taoism, Buddhism and Chinese folk culture in one complex but I also think it’s a great representation of the special cultural mix of Macau. Rosalind Cummings-Yeates is a journalist, author and blogger who specializes in travel and culture topics. She loves guiding readers through the richness of various cultures and discovering the essence of a destination. Her travel and culture blog, Farsighted Fly Girl, offers travel insights through the music, food, art and history of various countries and cultures. Join her on the journey at www.Rosalindcummingsyeates. blogspot.com.